The two Koreas’ militaries and the United Nations Command agreed to complete until Thursday the withdrawal of firearms and guard posts from the jointly-controlled area inside the heavily-fortified Demilitarized Zone. During the trilateral meeting held on the border village of Panmunjom, the three militaries confirmed that the two Koreas have cleared landmines near the JSA and a mountainous area inside the DMZ. The disarming JSA and demining operation were a part of a military agreement signed after the inter-Korean summit last month in Pyongyang. The two Koreas’ military chiefs then agreed that disarming the JSA will come after the demining operation is complete. 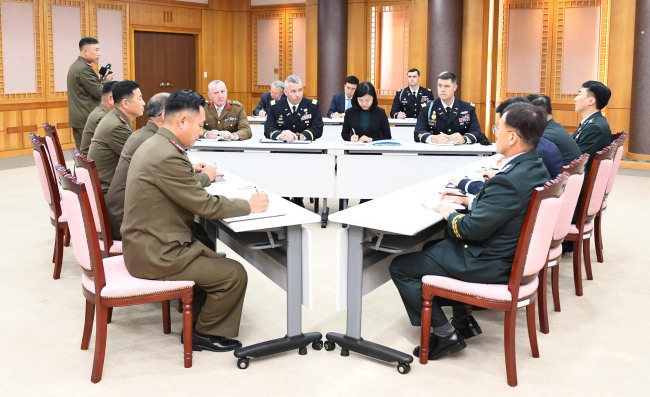 Army Col. Cho Yong-geun and his North Korean counterpart Om Chang-nam attended the meeting. The UNC delegation was headed by US Army Col. Burke Hamilton, the Military Armistice Committee secretary. By disarming the JSA, the two Koreas’ militaries are seeking to return the jointly controlled area to the state that existed before the grisly ax murders of two US Army officers by North Korean soldiers in 1976. Before the murders took place inside the JSA, the two Koreas’ militaries patrolled freely there without heavy weapons along the guard posts. Since then, soldiers from the two Koreas and the UNC have been restricted to their own patrol areas, separated by the Military Demarcation Line inside the JSA. The participants also exchanged views on the progress made since the implementation of the comprehensive military agreement signed by the two Koreas’ military chiefs after the summit in Pyongyang. Then Defense Minister Song Young-moo and his North Korean counterpart, No Kwang-chol, agreed to cease all hostile acts in the border region, as well as to the suspension of military drills and the establishment of a no-fly zone. The two sides began removing land mines around the JSA and a mountainous area inside the DMZ near Cheorwon, Gangwon Province. Demining will be followed by excavation of the remains of those killed during the Korean War. The inter-Korean military agreement has raised concern in Washington that South Korea is moving too quickly in engaging with the North despite a lack of progress in parallel talks aimed at denuclearizing Pyongyang. Foreign Minister Kang Kyung-wha has acknowledged that US Secretary of State Mike Pompeo expressed “discontent” with the military pact, Gen. Robert Abrams, who is to replace Gen. Vincent Brooks as commander of the UNC, noted the efforts to demilitarize the border region are subject to UNC approval.